Duotight fittings are high-quality push-in fittings that seal tight and offer superior sealing capacity due to the double O-ring sealing design. The secret to Duotight’s superior sealing performance comes from the fact that they use not one, but two high-quality EPDM O-rings. The double O-ring means they have literally twice the sealing surface when compared with other push-in fittings. This makes them more reliable and significantly reduces the chance of leakage. The double O-ring system also means that tubing can be bent at a much tighter radius without causing leaking issues, which can be an issue with other fittings. 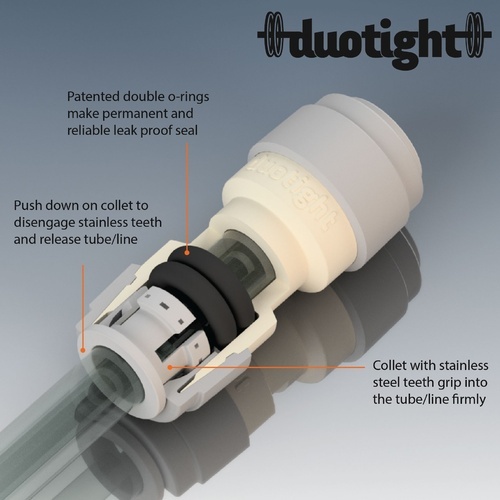 This combination of factors makes Duotight the most reliable push-in fittings on the market. EPDM offers excellent chemical resistance for a longer life span. When compared with silicone and vinyl, EPDM has much better gas transmission rates, better wear resistance, and is BPA-free. We recommend cutting your tubing straight, not on an angle, to ensure the line forms a complete seal. To remove the fitting simply push in the collet and the hose can be removed. This Duotight elbow fitting is compatible with EVABarrier 9.5 mm OD tubing (D1719).